Looking at the winners, fashion and drama at the 2014 SAG awards. The 2014 SAG (Screen Actors Guild) awards were held on January 18 in Los Angeles, and Hollywood's glamorous stars made sure to attend. Sofia Vergara, the gorgeous star of Modern Family, shows off her stunning figure in a metallic gown. Please click Next to see more pictures. Cate Blanchett won the Best Actress award for her work in Blue Jasmine. Amy Adams carried forward her bold look in her film American Hustle on to the red carpet, and wore a deep blue bold Antonio Berardi dress. The film won Outstanding performance by a cast in a motion picture. Julia Roberts, who was nominated for her role in August: Osage County, waves on the red carpet. Sandra Bullock, who was nominated for Gravity, wears green. Jennifer Lawrence seems to have become a red carpet favourite. And here's why we love her. Tom Hanks arrives with his gorgeous wife Rita Wilson. Bradley Cooper had an awkward moment on the red carpet. A Ukrainian journalist wrapped himself around Cooper's legs, when the actor was having a chat with his American Hustle co-star Michael Pena. It took some muscle to finally untangle him. Lupita Nyong'o, looking pretty in blue, won the Best Actress award for her work in 12 Years A Slave. Matthew McConaughey won the Best Actor award for his work in Dallas Buyers Club. He's seen here with his wife Camila Alves. Emma Thompson was a star at the awards show, and here's why. 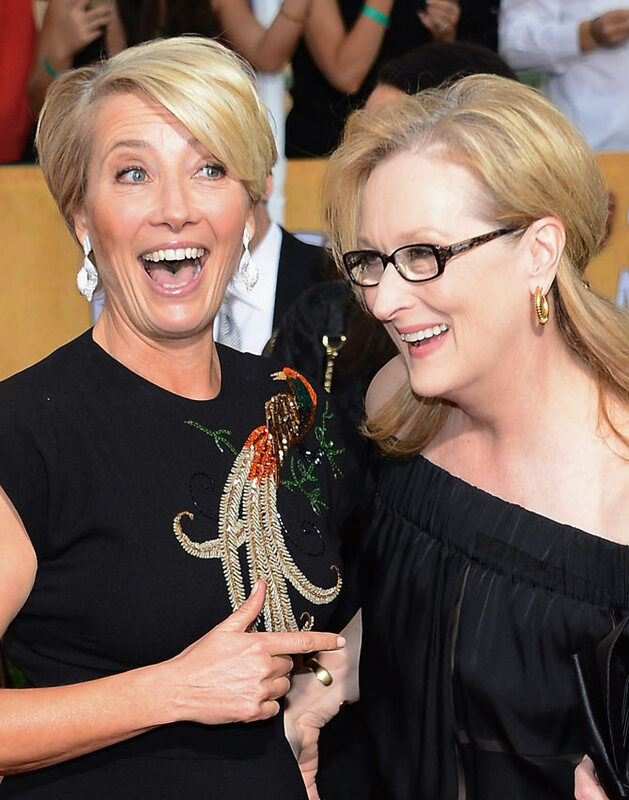 Here, she shares a laugh with Meryl Streep. Will these films win big at the Oscars? Golden Globes, 2014: Did the right films win? VOTE! Golden Globes Quiz: Who is this stunning actress?